Back in 2009 I helped raise money for Austin Pets Alive, a local nonprofit group dedicated to saving the lives of pets in Austin. They’ve accomplished many great things since they were formed in 1997 — you can visit their web page for more information on the wonderful work that they do. Back in 2009 I set a couple incentives for reaching fund raising goals. Specifically, if we raised $500, then I would either shave my legs, bleach my hair, or dye my hair (anyone who donated would get to vote on which one I’d do). And if we raised $1000, then I would get a tattoo. Although we raised over $1000, surprisingly (to me) the majority of people who donated voted for me not to get a tattoo. Anyway, it was a lot of fun last time around, and the money was a great help to APA. So I decided to do it again this year! To donate, please follow this link. I will receive periodic reports from APA with a list of who has donated and how much they have donated, so you shouldn’t need to report it to me (although it’s fine if you would like to). This year the fundraiser runs through October. And while it technically doesn’t begin until August, the folks at APA have kindly offered to allow me to start a little early. Since this means we have 4 months to raise the money, I am setting a more ambitious goal of $3000. If we raise $500, I will bleach my hair. This goal has been reached! Photos are here. If we raise $1000, I will dye my hair (after bleaching it). Folks who donate money will be able to vote on the color. I will leave it dyed until it grows out nice and shaggy. This goal has been reached! Voting is underway now to determine the color. Blue is the winning color! Photos are here. If we raise $1500, after my hair is dyed and it has grown long and shaggy, rather than getting a regular haircut, I will shave my head. If we reach the ultimate goal of $3000, I will get a tattoo. I have provided a few design options (all of which meet with my approval), and folks who donate money will be able to vote on the design which is used. Although the fund drive runs through October, as soon as I hit each target, I will perform the incentive for that target. So if on July 15th we hit the $500 target, then I will bleach my hair shortly thereafter (and, of course, post pictures). If we hit the $1000 target on July 20th, then I will have everyone (who has donated so far) vote on what color I should dye my hair, and then I will dye it. And so on. Is your Cat confused about the alternative vote? But you don’t really need to worry about the details. The high level summary is the more you donate, the more influence you have on the outcome of the voting. And by sending in your list of preferences from most preferred to least preferred, the result is that the truly most popular option will win. 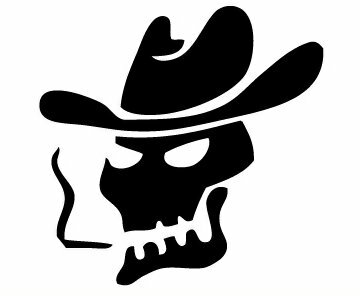 Finally, for the tattoo, I will provide “no tattoo” as an option for which people can vote (since last time several people said they wanted to donate, but only if that was a choice). So, let’s give a concrete (but simplistic) example. For this example I’m assuming the only hair dye color options are pink, blue, and red, and the only tattoo options are no tattoo, snowman, and weasel. July 10: Paula donates $250. July 12: Trevor donates $300. This reaches the $500 target, so I bleach my hair and post pictures. July 19: Randall donates $400. First round of voting has Paula giving her 12 votes to pink, Trevor giving his 14 votes to pink, Randall giving his 16 votes to blue, and Inez giving her 14 votes to red. So that works out to 26 for pink, 16 for blue, and 14 for red. None of them has a majority. So we cast off the lowest vote-getter (red), and then have a second round of voting. In this round, Paula gives her 12 votes to pink, Trevor gives his 14 to pink, Randall gives his 16 votes to blue, but now Inez gives her 14 votes to blue (since red is no longer an option, and she listed blue as her second choice). Now our totals are 26 pink, 30 blue. So blue has more than 50% of the total and thus wins (even though pink had the vote total in the first round). Blue wins, so I dye my hair blue and post pictures. July 25: Randall donates $300. July 28: Pete donates $500. This reaches the $2000 target. Unlike previous targets, I do not immediately shave my head. But once my hair has grown out long enough that I need a haircut, I will shave my head and post pictures. August 10: Octavia donates $1000. This reaches the $3000 target. I send out an email collecting tattoo votes from everyone who donated. This time around, Paula still has 12 votes, Trevor still has 14 votes, and Inez still has 14 votes (since none of them have donated any more money since the last voting round). However, Randall now has 24 votes (since he has now donated a total of $700). Also Pete donated $500, giving him 20 votes, and Octavia has a whopping 50 votes having donated $1000. I’m not going to go through another voting example here, but each of these people will email me their list of tattoo choices, from first choice to last choice. I will tally the votes and find out which one won. If a tattoo design won, then I will go and get the tattoo soon thereafter and post pictures. 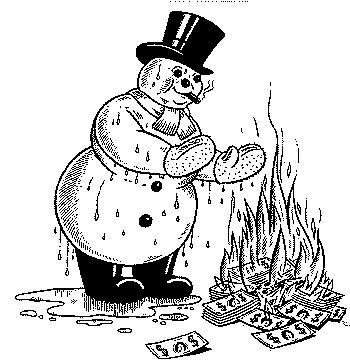 I went to Google and typed “They Might Be Giants Snowman” to get some digital copy of the snowman burning money to keep warm. I ended up on your blog. This is a small world.